Through 3.8 billion years of trial and error (sometimes referred to as evolution), nature has developed many elegant, efficient, and sustainable biologically based solutions to some of the challenges that vex geotechnical infrastructure systems today. Examples include ant excavation processes that are 1,000 times more energy efficient than man-made tunneling machines, carbonate-cemented sand that is exceptionally resistant to erosion and earthquakes, and self-sensing and self-healing tree root structures that are 10 times more efficient than any mechanical soil reinforcing system developed by humans. The Center for Bio-mediated and Bio-inspired Geotechnics (CBBG) seeks to understand and harness the scientific processes and principles of natural phenomena such as those cited above to develop more sustainable, safer, less intrusive, more resilient civil infrastructure systems. The Center’s approach embodies a transformational shift from traditional energy-intensive, mechanical methods for engineering the ground to a sustainable, nature-compatible biogeotechnical approach that employs innovative bio-mediated and bio-inspired technologies to meet the demands of modern society. In the CBBG, Arizona State University (ASU), Georgia Institute of Technology (GaTech), New Mexico State University (NMSU), and the University of California, Davis (UCD) have joined to develop a new generation of geotechnical processes and solutions inspired by nature to transform the design, construction, operation, and maintenance of resilient and sustainable systems for civil infrastructure. The CBBG will realize this vision by combining fundamental scientific research with application-based engineering advances, facilitated by enabling technology and systems integration test beds. CBBG research, develo­­­pment, and implementation will be informed by input from our industry partners to develop sustainable and cost-effective processes and products that can be readily commercialized and deployed in civil infrastructure systems. These partnerships poise the Center to address the pressing need for sustainable infrastructure development to maintain the quality of living in the U.S. and meet the needs of the world’s growing industrialized population. The CBBG strives to catalyze this transformational shift in engineering practice for geotechnical aspects of infrastructure systems by filling critical gaps in research, education, and workforce development. Many of the problems and opportunities in this emerging field of biogeotechnical engineering are inherently interdisciplinary. The CBBG partners together provide the critical mass needed to integrate the necessary disciplines, bridge knowledge gaps, accelerate technology development, and educate a new generation of engineers, collectively transforming biogeotechnical engineering from a specialty research niche into established practice. The CBBG integrates research and education programs in biogeotechnical engineering at four Universities into a unified team that addresses the broad spectrum of bio-mediated and bio-inspired geotechnics. The synergy generated by merging these four academic programs into a multi-disciplinary team within a Center that is informed by a robust and diverse Industrial Affiliates program and facilitated by a stable source of long-term funding is accelerating the development and deployment of innovative and transformative biogeotechnical methods in engineering practice. The CBBG research program is focused upon developing sustainable, nature-inspired solutions to geotechnical problems in three focus areas, or thrusts: geologic hazard mitigation, environmental protection and ecological restoration, and infrastructure construction methods and materials. The geologic hazard mitigation thrust addresses unstable soil conditions, including those induced by earthquakes and other external events, which damage foundations, slopes, embankments, port and harbor structures, utilities, and other civil infrastructure systems. The environmental protection and ecological restoration thrust seeks to restore natural systems damaged by anthropogenic activity and to minimize the environmental impact of infrastructure development and renewal. The infrastructure construction methods and materials thrust looks to shift construction away from Portland cement-based materials and brute-force mechanical soil improvement and geotechnical construction methods toward more sustainable materials and construction techniques. A fourth thrust contains cross-cutting projects that bridge across all three of the topical thrusts and cannot be categorized as being primarily associated with any of them. CBBG research activities take place on three levels (or planes) of maturity: the fundamental knowledge plane, the enabling technology plane, and the systems integration plane. Projects on the fundamental knowledge plane are designed to identify and understand the processes by which nature efficiently creates sustainable geo-materials and conducts geo-construction activities. 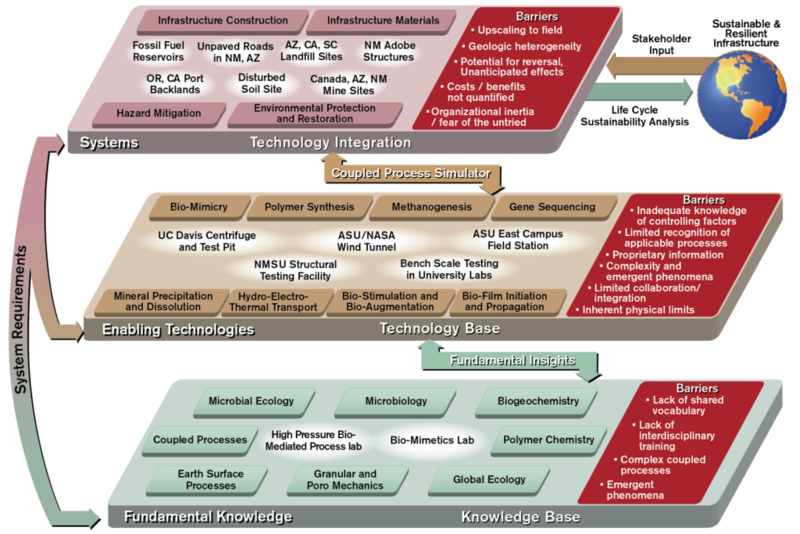 On the enabling technology plane, techniques to mobilize the identified natural processes for geotechnical engineering purposes are developed on a laboratory and large test facility scale. On the systems integration plane, processes proven on the enabling technology scale are implemented on field-scale test beds. Projects that cut across all four thrusts and all three planes include development of a coupled process simulator numerical tool and lifecycle cost sustainability assessment. The coupled process simulator will allow for evaluation of the relationship between system inputs and outputs. Life cycle cost sustainability assessment is used as a tool to assess the viability of projects on all three planes. The Education and Outreach is focused around the challenge of developing a work force for the emerging field of biogeotechnical engineering representative of the diversity of the general population. The CBBG Education Program aims to build a pipeline of creative, motivated, knowledgeable students who will drive the development of innovative and sustainable biogeotechnical techniques and the assimilation of these techniques into the mainstream of geotechnical engineering practice. To support this mission, CBBG seeks to inspire students by the connection of biogeotechnical engineering with the natural world to learn foundational content from the K-14 level through postgraduate continuing education. CBBG exposes students to biogeotechnical engineering concepts using interactive, multimedia, video, and online learning designed for all levels, allowing us to reach local and global audiences. Pre-College Education: Consistent with the CBBG’s focus on bio-inspired/bio-mediated processes, our education program places the study of nature at the center of our activities. The CBBG education program links cutting-edge, innovative, high-tech research with tangible, knowable aspects of a student’s natural world. We believe this engages students and encourages them to learn about the earth, soils, and how to design sustainable engineering solutions. This is achieved across environments (e.g., laboratory and field) and across media (e.g., static and dynamic electronic learning modules). We design our activities to engender excitement and enhance engagement in and attitudes toward becoming STEM researchers and science practitioners. CBBG development of curriculum modules for K-12 through the two-year community college level provides an avenue for teaching the current standards-based curriculum while promoting an interest in science, technology, engineering, and mathematics. These modules, developed through our Research Experience for Teachers (RET) program, engage students in hands-on, inquiry- based learning experiences. In the RET program, teachers in partnering school districts are given professional development focused on increasing their content knowledge and developing strategies for implementing inquiry-based STEM lessons in the classroom. We also have a Young Scholars program for promising high school students. The Young Scholars interact with CBBG scientists, engineers, and industry partners as they explore the field of biogeotechnical engineering. University Education: CBBG curriculum development includes stand-alone lectures for first year introduction to engineering courses, multi-lecture modules and hands-on experiments for third year courses in geotechnical engineering, and entire courses for fourth year technical electives and for graduate programs. CBBG also offers research experiences to undergraduates hired as hourly workers, undergraduate participants in the summertime Research Experience for Undergraduate (REU) program, and graduate student research assistantships. Additional education activities include participation in CBBG-sponsored webinars, seminars, workshops, Student Leadership Council activities, the CBBG mid-year and annual meeting, and professional society meetings. All four CBBG partner institutions maintain established ties with industry. We leverage these relationships to provide students with internship opportunities, design projects guided by industry mentors, informal engagement with industry leaders, direct instruction originating from our industrial partners, and career development workshops led by industrial partners. Industry Education: CBBG provides continuing education opportunities to its industry partners and to the geotechnical community at large. These opportunities include webinars and short courses on biogeotechnical concepts as well as researcher in residence opportunities for our industrial partners. 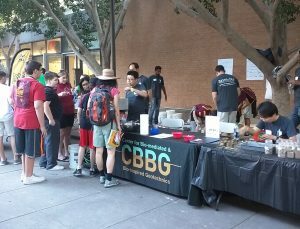 Outreach: Through university-sponsored events offered across the four partner institutions, CBBG reaches out to inform the broader community about the ongoing research of the Center as well as the potential contributions of biogeotechnical engineering to sustainability, infrastructure development, and infrastructure resilience. Our goal is to engage stakeholders (e.g., community members, future engineers, and policy makers) in discussions about sustainability and about working with (rather than against) nature, provide demonstrations of the possibilities of biogeotechnical techniques, and stimulate interest in young children and adolescents to explore geotechnical engineering and related fields as possible career paths. The CBBG Innovation Ecosystem brings together the key industrial, regulatory, and civil infrastructure stakeholders necessary to move CBBG’s research and development forward. CBBG’s leadership and participating faculty researchers have decades of experience working with and within the civil infrastructure industry, including design, construction, environmental remediation and protection, hazard mitigation, and resource recovery, which places the Center in an ideal position between markets and customers. CBBG research is driven by input from the owners, designers, and contractors in the Industry Practitioner Membership program and field tested with monitoring programs vetted by both local regulatory agencies and owners to streamline technology acceptance and implementation. In addition to streamlining technology implementation, the Center actively incorporates entrepreneurship themes into its curricular activities. The CBBG has engaged partner University Technology Transfer organizations, para-governmental, umbrella organizations, and other entities dedicated to promoting entrepreneurship and nurturing start-ups. To cultivate income sources so that the Center can be self-sustaining after 10 years, CBBG couples the technology transfer offices of each partner universities with their associated research laboratories while growing a community of relevant industry and agency stakeholders and regional innovation ecosystem organizations. Intellectual property (IP) provisions agreed to by all partner universities are in place to facilitate technology transfer. CBBG brings together a suite of institutions, laboratory facilities and test beds that is unique in the nation, providing exceptional capabilities in leading edge technology and experimental methods. While our facilities are geographically dispersed, we view this as an opportunity to reach a wider student and stakeholder constituency. The CBBG Center is designed to connect its members seamlessly through a shared use policy, and frequent in person and mediated communication. CBBG is headquartered in the renovated first floor of the Barry M. Goldwater Center for Science and Engineering Building at ASU. Headquartered space includes an Exploration and Training Room fully mediated for distance learning, a state-of-the-art Conference Room, and a Learning and Discovery Center for outreach activities. Facilities at ASU include an approximately 1800 square foot newly renovated wet lab dedicated to biogeotechnics and shared use of three other geotechnical laboratories and the environmental laboratories of the SWETTE Center of Environmental Microbiology (the geotechnical teaching laboratory). CBBG facilities also include a field station on the Polytechnic campus with an ASTM-compliant large scale (40 ft x 8 ft deep rainfall simulator, a geotechnical test pit with a 20ft x 8 ft x 12 ft deep main chamber), and a mobile microbial crust laboratory. CBBG facilities at the University of California, Davis include the 2,500 square foot Soil Interaction Laboratory equipped with high-end laboratory equipment for biogeotechnics, including incubators, centrifuges, peristaltic pumps, an optical density analyzer, and digital meters for monitoring various chemical compounds. The Center for Geotechnical Modeling at UC Davis is home to a 9 m radius centrifuge affiliated with the NSF National Hazards Engineering Research Infrastructure (NHERI) program and a smaller 1 m radius centrifuge. The large centrifuge can accommodate payloads up to 2000 kg and can model the performance of geo-structural systems subjected to earthquake loading. Georgia Tech facilities include two unique biogeotechnical testing facilities. The 2,500-square foot Laboratory for Bio-inspired Processes explores biological systems as engineering analogs (e.g., root and reinforcement mechanisms) to identify next-generation bio-inspired processes. The lab is equipped with instrumentation and devices to visualize/monitor biological processes in their natural subsurface environment. The 3,000-square foot High-Pressure Bio-Mediated Processes Laboratory (HPBPL) will allow the study of bio-mediated processes in sediment and jointed rock systems subject to high fluid pressure and effective stress. 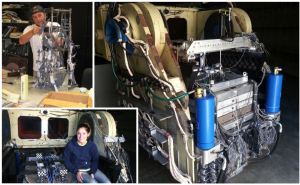 This HPBPL enables exploratory studies for novel anaerobic consortia from the sea floor and, deep terrestrial environments. Facilities at New Mexico State University include the Structural Systems and Materials Testing Laboratory, a 2700 square foot facility with a 600 square foot strong floor, providing adequate space for large and small scale subassembly testing. The laboratory is equipped with several high-speed, multi-channel data acquisition systems that allow near simultaneous recording of over 50 channels of data that can be used in the laboratory or transported for site investigations. Additional equipment includes a freeze-thaw chamber, a universal testing machine with 400,000-lb force capacity, and a one million pound compression machine. Under the leadership of ASU, the CBBG unites four partner Universities who are committed to a common goal of sustainable infrastructure development and rehabilitation and have strong ties to industrial partners and international collaborators. Each of the partner Universities will lead one of the thrust areas (including the cross-cutting thrust). The leadership team is comprised of the Center Director and Deputy Director (both from ASU), the four thrust leaders, Education, Pre-College Education, and Diversity Directors, the Industrial Liaison Officer, the Administrative Director, and two Project Coordinators (one for Education and one for Business Administration). The leadership team will make collaborative decisions based upon advice on strategic direction and project execution from the Industry Practitioner Advisory Board and an external Science Advisory Board. A Dean’s Council will provide oversight to maintain balance and fairness with respect to Center programs and funds distribution. The National Science Foundation, through their program director and annual site visit review panels, will also provide input to the leadership team. Integration of the research among the partner universities is coordinated by the four thrust leaders (one from each partner University). CBBG facilities at the four partner Universities are treated as shared use facilities such that investigators from any one of the partner Universities have access to the facilities at the other three partner Universities at no cost. Education and outreach activities are overseen by the Innovation, Diversity, and Education Activities (IDEA) working group, chaired by the Deputy Director of the Center and including the College Education Director (from ASU), the Pre-College Education Director (from NMSU), the Diversity Director (from NMSU), and the Outreach and Education Coordinator and Disability Representative (from ASU). The IDEA working group oversees the Curriculum Committee, which is responsible for review and approval of all education modules developed by the Center and includes a faculty member and student representative from each of the four partner Universities.